Christine Lampard wearing her Latitude and Longitude Necklace seen on Lorraine and featured in Hello Magazine, the Daily Mail AND OK Magazine! Christine Lampard spotted on Lorraine looking joyously happy about her pregnancy news and wearing her Latitude Longitude Birthstone necklace in Gold. Hand engraved with a particular location close to her and Frank Lampard’s hearts. Set with their birthstones. Wishing you, both the very best of luck in this new chapter of your lives! Latitude and Longitude Necklace is the perfect personalised gift if you are wanting to choose a necklace that is truly unique while also being very thoughtful and meaningful. 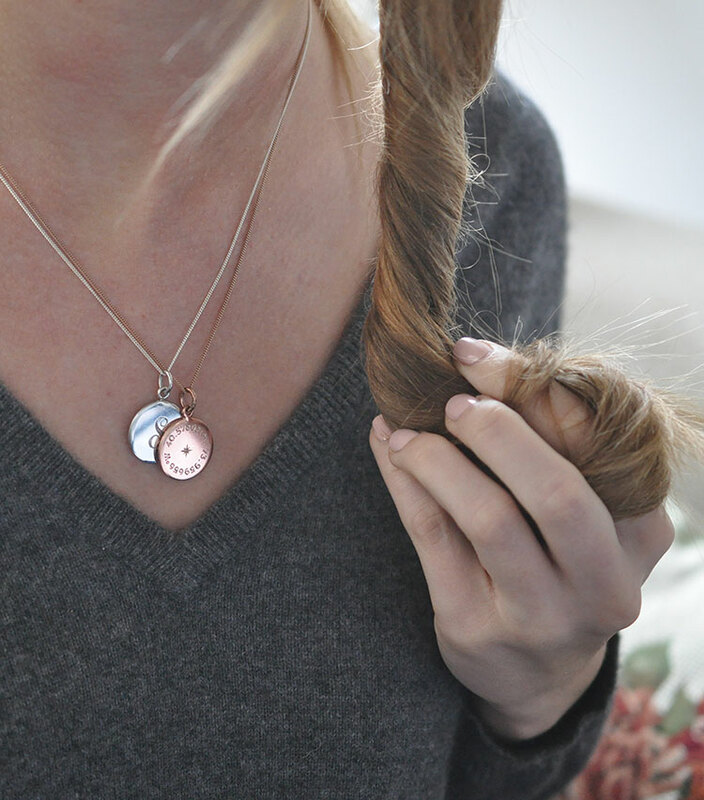 The latitude and longitude coordinate mark out a unique location specially selected by you, that we hand-engrave around the disc charm to commemorate and create your very own keepsake memory token to be worn and treasured forever. ” Read more about their wonderful news here on HELLO! the Daily Mail and OK magazine. Our Latitude and Longitude Necklace is inspired by ancient times and their tales and stories of great expeditions and voyages. Since the time of the ancient Greeks, mapmakers made their voyages guided by starlight, the sun and the eclipses of Jupiter’s moons all in orbit around the Earth. These early explorers were astronomers, following celestial navigation across the deep blue oceans onto new lands otherwise untouched. This way of determining locations by the observation of celestial bodies is the origin of latitude and longitude coordinates. Knowing that the movement of the starlight has predetermined a particular place, and the story of time makes your favourite place all the more precious. And it is this that inspired us to hand engrave solid discs of precious metals, embellished with star set gemstones reminiscent of a compass and stars from the night skies above. What longitude and latitude would you choose? 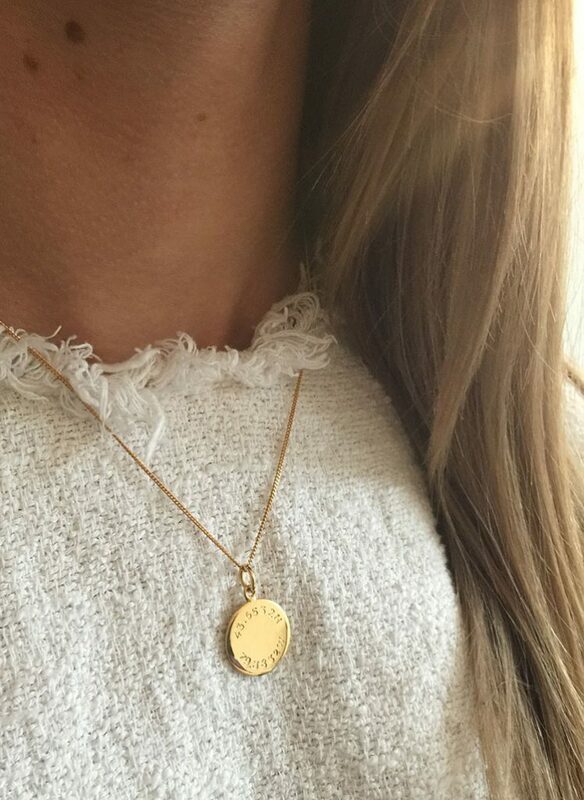 While every girl loves a piece of jewellery, there is an even greater chance that she would love a personalised piece, and our Latitude and Longitude Necklace is a chic way of commemorating a memory shared with your loved one. The coordinates you choose is entirely up to you, from simple spots to exotic locations, it is entirely up to you. Maybe the very first place you met, a place full of laughter and happiness, a holiday and travelling trip you shared together. Or simply the location of your favourite coffee shop where you share all your secrets and catch up with your BFF, or perhaps your childhood home and celebrate family love. Our Latitude and Longitude Necklace Collection allows you to choose various types of personalisation. The classic Latitude and Longitude Necklace is hand engraved with the coordinates chosen by you and, like all pieces from Bianca Jones Jewellery is available in various precious metals including Sterling Silver, Yellow Gold Vermeil, Rose Gold Vermeil and Solid Gold to suit all preferences of precious metals. To make the Latitude and Longitude Necklace even more personal, you can embellish the piece further by choosing a brilliant cut gemstone to be adorned on the piece. There is the Diamond Latitude and Longitude Necklace or Birthstone Latitude and Longitude Necklace. The diamond to symbolise everlasting love and affection resembling a star from the skies above and a reminder of how the latitude and longitude coordinate system came into being. Alternatively choose a precious birthstone, perhaps of her birthstone, so the necklace is all about her, or perhaps one associated with values important to you both or one to symbolise someone special to you perhaps your child. Read more about the legends and myths behind each birthstone on our blog. Our Latitude and Longitude Necklace is also available as part of our Double Disc Collection. Team up the Latitude and Longitude Necklace with an Initial Charm, also hand engraved with a scrolled initial. Double up the personalisation with the initial of your loved one and coordinates of a special place close to your heart. The Latitude and Longitude Necklace is a must have, and the personalised gift of dreams for the one that means the world to you. ‘For our 21st birthdays me & my besties got each other a Birthstone Latitude & Longitude Necklace with the coordinates of the place where we first met & owe for bringing us all together all those years ago, and our birthstone. Secret Latitude & Longitude coordinates to remind me of my truest & closest friends still causing totally fun chaos together today’. 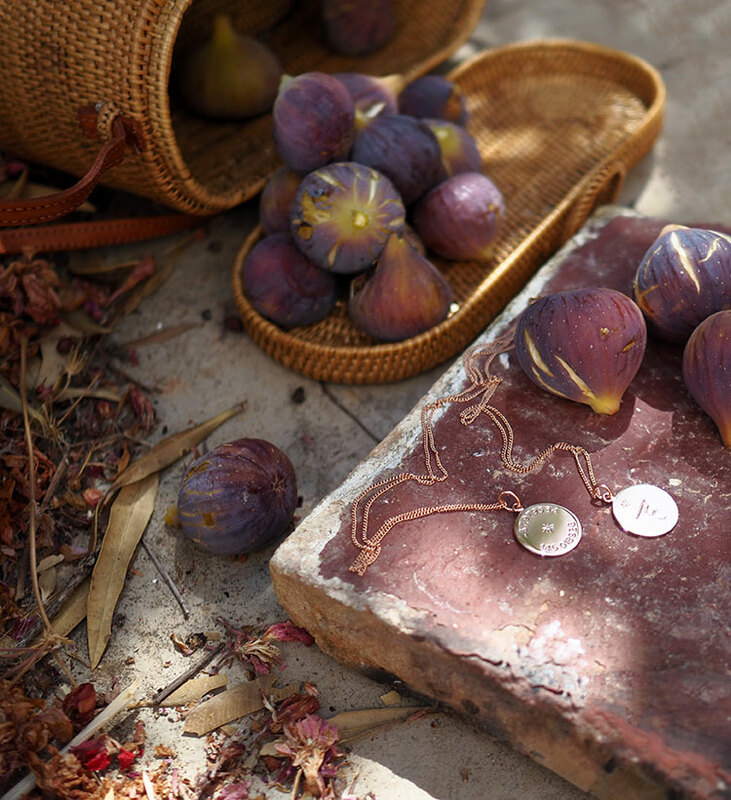 The Latitude and Longitude Necklace also make for the ideal gift for the avid globetrotter in your life. Maybe your friend, daughter, niece, goddaughter is about to go on a journey around the world, and you are wanting to treat her to a good luck leaving gift. Why not choose to have the coordinates of her home to be hand engraved on the disc so that she can carry a little piece of home on her adventure. Or maybe someone close has just returned from their trip, and they now have found their absolute favourite beach, city, town or village. Why not find out the coordinates of their favourite destination so that they can have a permanent memory of this place carried around their neck reminding them of their trip of a lifetime. Either way, whether you choose the coordinates of home or their favourite place from their journey, the Latitude and Longitude Necklace is the perfect personalised gift for the traveller in your life. A sure bet that this necklace will be treasured by them forever. For the newlywed, or bride to be the Latitude and Longitude Necklace is a great alternative to a classic personalised piece of jewellery to commemorate their big day. A great gift for the maid of honour and the bridesmaids to the bride or from the hubby himself. Why not create a keepsake token of the big day by choosing to have the coordinates of the wedding venue or the location of the proposal when he popped the big question hand engraved on the disc. The Latitude and Longitude Necklace is a unique modern-day piece of jewellery that commemorates the day of every girls’ dream, which will be proudly worn around her neck and carried close to her heart every day. If you’re the future hubby looking to organise the honeymoon for you and your girl then why not surprise her with the location in the form of the Latitude and Longitude Necklace, keep her guessing where she’s going. Once you’ve got the honeymoon all booked up, surprise her with the Latitude and Longitude Necklace hand engraved with the coordinates of the secret honeymoon destination. A gift that will have her tearing up for sure, and a keepsake of your honeymoon holiday forever. 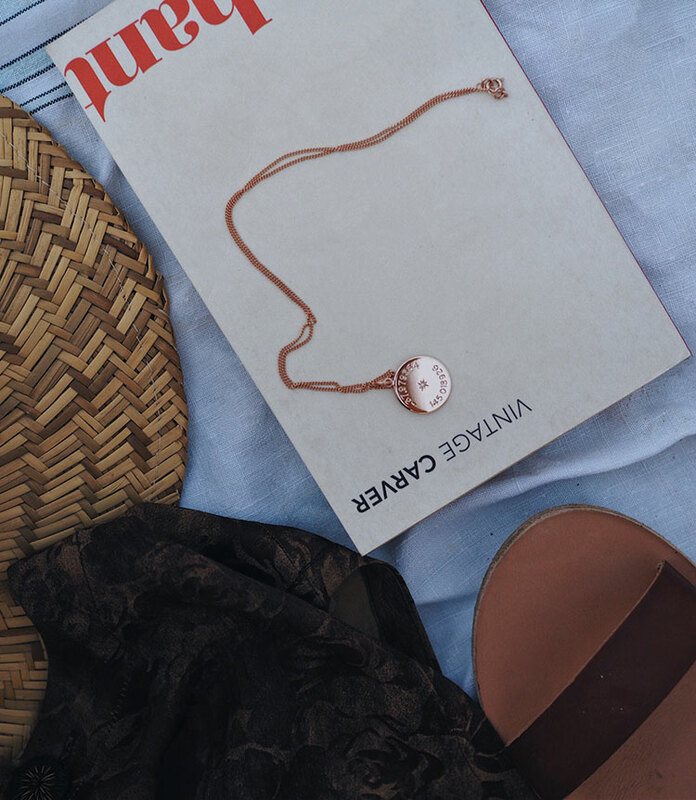 Carry an exceptional location with you always with our new Latitude and Longitude Necklace. A treasured piece marked by the natural wonder of the celestial heavens. For your loved ones.